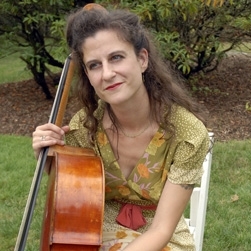 I love bringing the elegance and beauty of the cello to the special events in people’s lives, especially weddings! Twenty years of wedding experience allows me the expertise to plan and create a unique and memorable musical experience for your ceremony. One that conveys your personal style and creates the ambience you desire for this special day. And as a solo cellist I have the energy and musicality to fill the room! A diverse range of music is at my fingertips from traditional favorites such as Pachelbel Canon and Handel’s Water Music to The American Songbook featuring lovelies like “Isn’t It Romantic”, “Blue Moon”, “The Rose Room” , to contemporary songs such as, “I Choose You” by Sara Bareilles, “Isn’t She Lovely” by Stevie Wonder and "Love Song" by the Cure. As a conservatory trained classical musician with tremendous versatility, I have played professionally in New York City for the past 15 years in a variety of ensembles and a multitude of New York venues from Carnegie Hall, BAM, Joe's Pub, to Mercury Lounge with musicians such as David Bowie, Rufus Wainwright, Linda Thompson, Trey Anastasio, and Phillip Glass, among others. I hold a degree in cello performance from San Francisco Conservatory of Music, with graduate studies at New England Conservatory of Music. My passion is singing and accompanying myself on the cello. To find out more about this aspect of my creative, professional life, visit leahcoloff.com. 2. 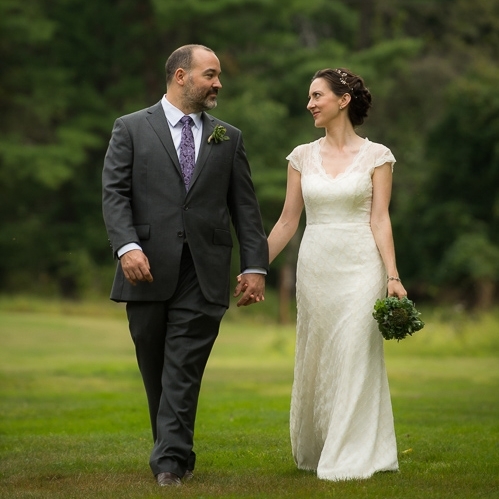 Julie and Morgan tie the knot at University Settlement in Beacon, New York on September 9, 2014. 3. Andrea & Corbett tie the knot in Brooklyn, NY at the Brooklyn Botanical Gardens on April 14, 2012. "I just can't express what it was like to hear the sound of your cello playing that dear special song for me as I waited with my family to come down the aisle. It was beautiful and perfect and like I had arrived home somehow! And the Talking Heads exit music was so awesome as well and having your presence and artistry before the ceremony and during the cocktail hour was so wonderful. Nothing about the day would have been as wonderful without you there!" 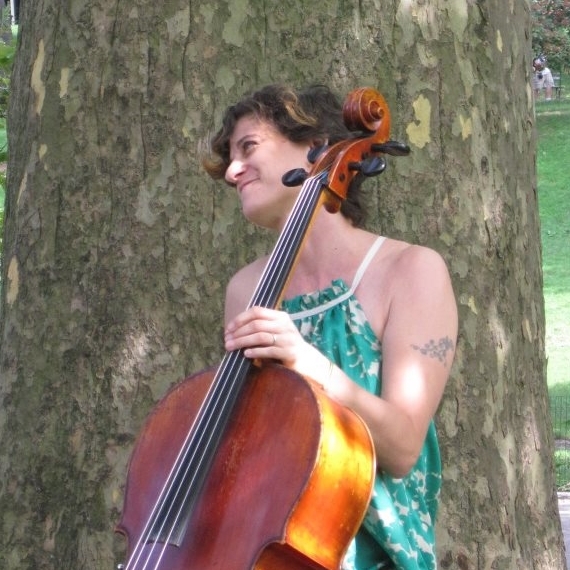 "We are so incredibly happy we found Leah to play for our wedding ceremony! Not only is she such a kind person and courteous and professional to deal with, she is an amazing musician. She even arranged a special piece of traditional Ethiopian music for us, and gave us very helpful suggestions for the other selections. We received lots of positive comments from our guests. Leah also played for much longer than we originally agreed to and in a different location than originally planned due to the weather, and she was incredibly understanding and flexible about it. I would give her 10 stars if I could :)"
We felt so unbelievably fortunate to have Leah play at our wedding, and our guests raved about the music. Leah is incredibly talented and professional, and she is also a kind and wonderful person -- someone we that we were so thankful was a part of our wedding celebration. And from our first meeting, Leah gave great suggestions for the ceremony, which ended up being the most special part of our wedding day. We have already recommended to another couple, and I highly recommend her to anyone who wants to create a special and beautiful atmosphere for their wedding day! my wedding was super crazy as i luckily pick the one and only snow storm day of 2011 in NYC, plus my venue was outdoor!! But Leah and her friend was great. They came early, played quite a while in freezing weather before the ceremony even when most of the guests were hidden indoor. the ceremony music was beautifully done too. also it was very easy and pleasant to communicate with her beforehand. she gave me a long list and was flexible to change according to my will too. I would definitely recommend Leah to any bride who wants a reliable musician at her wedding! "Thank you for your beautiful contribution to our ceremony. Everyone agreed that your gorgeous playing created a sense of both shared intimacy, and elevated spirit, that made a moving experience even more amazing." "Leah played cello for the cocktail hour at our gala benefit in February, adding the perfect, elegant touch as our guests arrived. She was a delight to work with, and came stocked with lots of great music, ranging from classical to contemporary, as well as some fantastic cover songs. It also didn’t hurt that she’s hip and well-dressed. I’d hire her again in a heartbeat". "Leah was amazing! The sound of her cello carried beautifully. We couldn't have asked for more magical music for our ceremony. It was so original (especially since we picked the music) and really set the most romantic mood. I wouldn't have changed anything at all. " Please give me a call at 646.515.4698 or complete the online contact form. I am happy to meet you in person. During your music planning process you're welcome to unlimited consultations via phone or email. Your remaining deposit is due the day of the event, immediately following the performance. 3-4 days before your event I will contact you to finalize event details. On the day of the event, I'll arrive 30 minutes early to set up, warm up and go over any last minute details with your event coordinator and/or officiant. Please contact me for a pricing quote. I would be delighted to sing a special song accompanying myself on the cello. The fee for a vocal and cello arrangement is $200. If you would like an ensemble for your wedding, I know many fine musicians. Prices vary. Please use the contact form for a quote. These are some questions I like to ask to inspire ideas in couples. You are choosing music for the one of the special moments in your life. You want to set to set the perfect mood. ~ What is the emotional tone you would like to create for your ceremony? Is is frisky and fun? A tone of reverence? Romantic? Casual and whimsical? Intimate? ~ What is your vision for the ceremony? Are you creating a traditional ceremony or are you wanting to break the mold? Maybe you’d like some traditional aspects, but also want to include some aspects of your unique cultural background or personal interests? For example, I arranged a special piece of traditional Ethiopian music for a bride who had a classic wedding, but wanted to add a special homage to her family. ~ Is there a special song or songs that you want to be a part of your ceremony? I can arrange music for solo cello or the ensemble of your choice. One bride knew she wanted an Eddie Vedder ukulele song, “Longing To Belong” for her processional. I arranged the song for violin, cello and voice. ~ Who is taking part in your ceremony? How many bridesmaids and groomsmen do you have? Do you have flower girls or a ring bearer? Who will walk down the aisle? and with whom? These days there are no rules for how ceremonies need to proceed and there are as many variations as there are weddings. Will you walk down the aisle with your beloved or walk down with your father or another significant person? ~ Are there special moment during the ceremony that would be enhanced by music? A few examples are lighting of candles, blessing of the rings, a moment of reflection for people unable to be present for the ceremony, before or after a reading, etc. ~Below is a outline of the moments where music usually takes place in a modern wedding ceremony. It is helpful to keep in mind when organizing your thoughts around the musical choices that need to be made! A traditional ceremony could also have special music for seating the mothers of the bride and groom. The prelude music and postlude music is often chosen by style instead of specific pieces which is easier on the couple. If you would like classical music I will choose pieces in that genre. You could also make the choice for contemporary songs or The American Songbook and standards and so on. Some couples like to choose the 2 or 3 songs directly leading up to the ceremony. When you choose me for your wedding you will have the opportunity for unlimited consultation in the process of making musical selections so the perfect ambience will be achieved! The list Below is only a sample of the wide variety of music that may be appropriate for your joyous occasion. I would be happy to work with you to find the music that is right for you. I am always happy to enhance my repertoire list. Your special song can be arranged for a minimal fee! 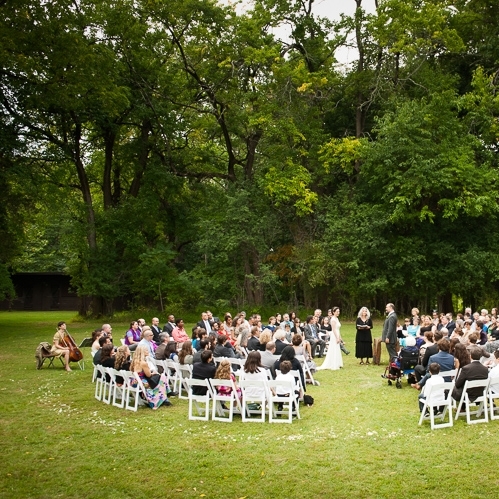 What if my ceremony is outside? I am happy to play outdoors, but will need to be under an umbrella or covering of some kind to protect my instrument from the elements. What do you usually wear? I usually wear concert black (dressy, all black), but I am happy to wear something more colorful or something to match the colors of your wedding, if possible. I don't require a break during the ceremony, but if I am playing 2 or more hours, a 10 minute break every 50 minutes is standard. Will you attend the wedding rehearsal? It is not usual for me to attend the wedding rehearsal as we will work out the music in detail. But if you feel more comfortable, I can attend for a fee of $100. Do you ever play with amplification? I do have a small amp that I can use if the space requires. Do you perform with singers and/or other instrumentalists? I am a pop singer and will gladly perform a special song for the ceremony. And, If you would like a classical music vocal selection, I know many fine classical singers. Yes, I can put together any ensemble for you! I have a song I'd like you to play that is not on your repertoire list. Can you still play it? Do we need to meet in person? We can do all of our communication over the phone and/or with email, but I would be happy to meet with you if that is your preference. Can you help with the music selection? Absolutely! Together we will come up with the perfect musical selections to enhance this momentous life event! What's included when I book you for my wedding? What if the ceremony starts late? It is rare, but if your wedding ceremony is delayed I will play prelude music to entertain your guests. I will never leave in the middle of a ceremony as I don't ever book weddings back to back!